Take a walk on the wild side with this gorgeous leopard printed dress. Cut to oversized, this relaxed leopard dress is perfect to dress up or down for whatever occasion. Complete your look with black over the knee boots and tote bag. I absolutely love this dress. It's smart enough to wear with a jacket and heels to work and also looks great with leggings and flats or boots. Very flattering shape, loose around the waist and hips but a good taper to a slim hem, sleeves long enough to cover those bingo wings. Buy a size smaller than you would normally. Love this dress bought in different colour too as style so comfortable and flattering! Went down a size too! Ordered a size smaller as other reviews stated it came up big and glad I did go down a size. Love this dress but needed to go down a size which I did. Can be dressed up or down - perfect for day to evening. 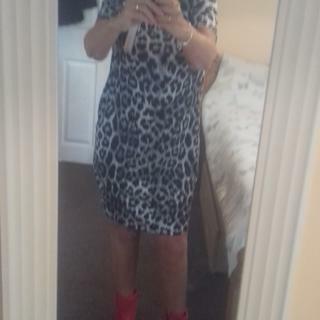 Lovely dress, very comfy and easy to dress up or down, I ordered the leopard print one as well and now have my eye on the red animal print which is a slightly different dress but looks just as comfy. Very well made. Lovely material. Beautiful dress. It sits well and moves without clinging. Definitely recommend this dress. Ideal for work to evening out. Good accurate sizing, prompt delivery and excellent quality. Lovely dress the size is a little bit generous but that's not a problem. Came the day after. Love this dress .... I am a size 14 and therefore ordered a 14 and it's great. I admit material is nothing special but it looks good. You can dress it up or down and look forward to wearing it often. Really lovely dress, I’m a 14-16 and ordered the 14 which was perfect. I got the grey one. Very flattering and can be dressed up or down. Would definitely recommend it. Gorgeous dress has given me my confidence back! Love the loose fit of the dress and the bonus of pockets. Perfect for Christmas day, no waist band digging in after dinner. Perfect fit, good quality and so comfortable to wear. Can be dressed up or down. Lovely dress so comfortable. Great for a night out with heels or daytime with black tights and boots. Excellent value for money, lovely shape to the dress too, or is it just my body that’s a lovely shape???? Was very happy with my purchase. Lovely fit and very comfortable to wear. Good value for money. I was very impressed with this dress ! It is really nice material and comfortable to wear. This is exactly what I was looking for! So comfortable and perfect length. Love the pockets. Would be great to have this in loads of colour choices please. Loved the fit, can easily wear long sleeved thin top underneath for extra warmth, generously sized probably because of loose type fitting, I ordered a 14 as I read about fitting already and it’s perfect (I’m between 14/16) glad I ordered 2 colours . Quality and fun . Best with a price offer and free posting . I own two of these in different colours . Wardrobe must have . This is a lovely dress and fitted perfectly. I’m quite tall so it came just above my knees. Received lots of compliments when worn. I just love this dress so comfy, true to size, you can ware it casual in day or dress it up in the evening, with a scarf and heels and still feel dressed up. I now have 2 of course! attractive fabric. smooth feel. this dress makes me feel feminine and confident. I love this dress it's a great shape and fit,looks great dressed up with heels and a jacket,and also with a polo underneath for a smart casual look. I love this short dress, it’s just to my knees I’m 5ft 2in . I have ordered the brown one as it a great price. Very flattering shape and fit will wear with woolly tights and boots or summer sandals and a tan great value. Great dress at a great price. Always get lots of compliments whenever I wear it. Like the relaxed fit and length to wear with leggings. Very pleased with this dress. The length is just right for me, being 4ft 11in. Also, having looked at reviews I ordered a size smaller than normal, and it is just right to disguise my lumps and bumps! Good material, which does not crease. Amazing dress, felt great when wearing it. Love this dress. This is the 2nd one I have had, loved the first so much ordered this one. Fits great, covers a multitude of lumps and bumps so very flattering. I guess you could get a way with a smaller size, but I have a large bust so went with a 16s. Love it, it is very comfortable to wear, I ordered my size but needed to reorder next size down as dress is loose fitting. The service was excellent with next day delivery on both orders, would recommend Roman without a doubt. I’m an 18/20 what size shall I order please? BEST ANSWER:I would advise a size 18 as this dress has a relaxed fit but if you wish to be extra comfy, order a size 20. I am an 18 and I purchased an 18 and it is perfect as it is a relaxed fit. If you bought a size 20 it would be far too big. I am 12/14. I chose the 12 which was an ideal fit. The 14 would have been much too big. I would suggest you go for the 18. I am a size 16 in Roman tops, but always buy size 18 in dresses as I don't like them clingy around the stomach area. I ordered 16 in this dress (both colours) and there is plenty of room - they are very generously cut, especially around the middle area. I hope this helps. I agree with size 18 unless you have a big bust then would go for size 20. The bottom of the dress is a loose relaxed fit. I am a 44 inch bust and have the size 18 as the bottom is big enough. I am usually a dress size 18 from Roman, as I don’t like them too clingy, but having seen previous reviews I went for the next size down & it fits perfectly . It’s generously cut so I think an 18 would be just fine. I’m a size 10 so that’s what I ordered and it’s perfect. It’s a lovely dress & bang on trend. I would order an 18 as I found the fit to be quite generous. I think if you order bigger it won't be flattering at all. Why not order both to try? I’m normally a size 16 in dresses but 14 in this one fitted me nicely. Lovely dress, I’m considering ordering it in another colour. I'm an 18 and ordered a 20 to be on the safe side. I think an 18 would have been fine. The 20 is too big but I wear it anyway. I am a size 16 and that size was a perfect fit, I have brought 3 different ones now they are so easy to wear and wash lovely. I would say an 18. I am between a 16/18 and ordered a size 16. It fits perfect. Such a nice dress and very comfortable. I’m a 12 and that’s what I ordered, but I think a 10 would have been fine as the sizing is quite generous. Roomy dress so would definitely go for 18. Looks lovely on. I would go for a smaller size as it's a very generous fit. If you are a true 18 that is all you will need. I went down a size. Normally a 12 bought 10. I'm a size 14 and it's a lovely relaxed fit. I would advise a size 20. It’s a lovely fit. I'm a 14 and ordered a 14. Perfect for me. I would say order the size you are . Generous size, 18 would be good. 18 should be fine , plenty room. A size 18 would be comfortable. 18 this dress is a big fit. I'd say order the 18. BEST ANSWER:As this dress is a slouch fitting style, you may feel more comfortable sizing down to a 12. If you are unhappy feel free to contact customer services for an easy exchange. What is the measurement of the bust/chest of a size 12 in inches please? BEST ANSWER:The bust of the size 12 is approx 98cm, which is approx 38.5 inches. Is it a tight fit? BEST ANSWER:This dress is true to size but has an oversized 'slouch' fit.